This article is about the Cheyenne chief. For other uses, see Two Moons (disambiguation). Two Moon (Credit: Northwestern University Library Edward S. Curtis's The North American Indian, 2003). Two Moons was the son of Carries the Otter, an Arikara captive who married into the Cheyenne tribe. Perhaps known best for his participation in battles such as the Battle of the Rosebud against General Crook on June 17, 1876, in the Montana Territory, the Battle of Little Big Horn on June 25, 1876 and what would prove to be his last battle, the Battle of Wolf Mountain on January 8, 1877. Two Moons' defeat in the battle at Wolf mountain by General Nelson A. Miles would inevitably lead to the surrender of his Cheyenne band at Fort Keogh in April, 1877. After the surrender of the Cheyenne band he led in 1877, Two Moons chose to enlist as an Indian Scout for the same General, Nelson A. Miles to whom he had not long since surrendered. As a result of Two Moons' pleasant personality, the friendliness that he showed towards the whites as well as his ability to get along with the military, General Miles appointed him head Chief of the Cheyenne Northern Reservation. As head Chief, Two Moons would prove to play a crucial role in facilitating the surrender of Chief Little Cow's Cheyenne band to Fort Keogh. Two Moons traveled on multiple occasions to Washington, D.C., to discuss and fight for the future of the Northern Cheyenne people and to better the conditions that existed on the reservation. In 1914, Two Moons met with President Woodrow Wilson to discuss these matters. 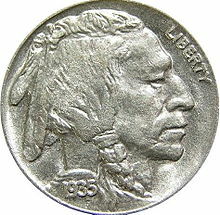 Two Moons was one of the models selected for James Fraser's famous Buffalo Nickel. 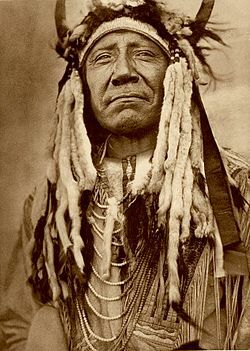 Two Moons died in 1917 at his home in Montana at the age of 70. Two Moons' grave still lies alongside U.S. Route 212, west of Busby, Montana. ^ Cheyenne Dictionary[permanent dead link] by Fisher, Leman, Pine, Sanchez. ^ Curtis, E. (1907) The North American Indian. Vol.6 The Piegan, the Cheyenne and the Arapaho..
^ Bowers, Q. David (2007). A Guide Book of Buffalo and Jefferson Nickels. Atlanta, Ga.: Whitman Publishing. pp. 38–39. ISBN 978-0-7948-2008-4. Time Life Books. (1993). The Wild West. Time Life Books. Richard G. Hardorff, Cheyenne memories of the Custer fight, University of Nebraska Press, 1998 ISBN 0-8032-7311-8. This page was last edited on 28 January 2018, at 13:51 (UTC).